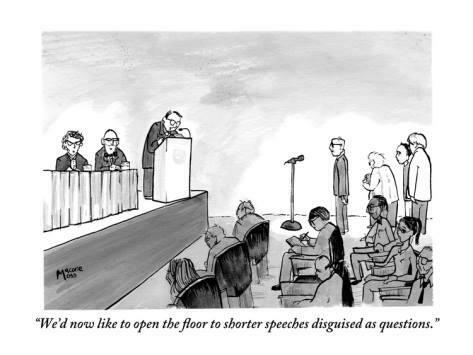 Many people are too shy to ask a question after a talk. They may think that many questions are unnecessary, self-important or off topic. Well, that is true. However, that shouldn’t stop anyone from joining in. With this guide anyone is guaranteed to be able to ask a perfectly normal question at any conference in Psychology/Cognitive Neuroscience and beyond. Was the talk any good? Did the presented study use animal models? Was the research fundamental (non-applied)? Was the research done on children? Did the study only use typical Western student participants? Talk at length about your own research followed by “this is less of a question and more of a comment”. Could the presenter influence your career? Yes: Hold eye-contact and nod (whatever s/he says). No: Check your smartphone for brainsidea updates. Picture: from twitter (https://twitter.com/tammyingram/status/343868282538954752/photo/1). Original source unknown.